Spanning the decades from WWII to the Yugoslav conflict, Ella Morris is the story of a continent, and of a woman torn between two men. Born in Berlin on the eve of Hitler's rise to power, Ella Andrzejewski escapes Soviet-occupied europe and finds a safe haven in England. Here, she marries George Morris but falls passionately in love with a French student ten years her junior. The ramifications of this love triangle and of Ella's traumatic past will reverberate through the generations, as her children try to find their own troubled peace in a continent still scarred by war. John David Morley was born in Singapore in 1948 and raised in Malaya and on Africa's Gold Coast before he went to school in England. He took his first job as a stagehand, followed by a spell teaching in Mexico. He spent three years studying in Japan, subject of his international bestseller PICTURES FROM THE WATER TRADE. Having made his home in Munich, the focus of Morley's life was in Central Europe, where for twenty-five years he worked as a location manager for Japanese TV and as a journalist for publication such as THE TIMES, SUNDAY TIMES MAGAZINE, the OBSERVER and CONDÉ NAST TRAVELLER. A collection of his journalism, ENCOUNTERS, was published in 1990. 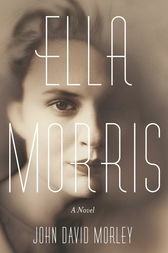 His tenth novel, ELLA MORRIS, was published in 2014.